Looking at a map of Michigan, I think most would agree that the Upper Peninsula of Michigan looks like a pretty darn interesting place. Sandwiched between three of the Great Lakes, the U.P. has over 1700 miles of continuous shoreline. That’s one hell of a beach. By the way, if you don’t have a map of Michigan, you can order a free one from the Michigan Department of Transportation. Michigan’s Upper Peninsula spans approximately 370 miles from end to end. At around 16,500 square miles, it comprises about 1/3 of the land mass of the State of Michigan, but only 3% of the population. That breaks down into a lot of open road with very little traffic. The U.P. has one hundred waterfalls, over four thousand lakes and thousands of acres of scenic state and national forests. Toss in spectacular lighthouses, some great festivals and a big dose of U.P. hospitality and how many more reasons do you need to come take a ride. So where to ride? If you like small towns, the U.P. is small town America and every town has an interesting piece of U.P. history tied to it. From the fur trade, which turned Sault Ste. Marie and Mackinac Island into major fur trading centers to copper and iron mining in the Keweenaw and Iron Ranges, to the logging of huge White Pines, there’s a story to be found at every turn. Two major highways crisscross the peninsula, Highway M-28 to the north and US-2 to the south. The two highways provide the main east/west links across the peninsula. They are roads that take you through small towns, along beautiful lakes shores and on stretches of road that will have you wondering if anyone lives here. While the two roads offer up some decent views of Lake Superior and Michigan, it isn’t until you begin riding Upper Michigan’s Side Roads that you begin to enjoy the best motorcycling the peninsula has to offer. 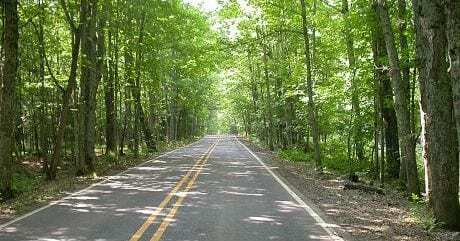 Upper Michigan will never be known for its fabulous motorcycling roads, although you’ll find some nice riding on my Roads & Rides page. Still, I haven’t met a biker yet who wasn’t glad he or she made the ride. Upper Michigan’s roads will take you to remote towns, through fantastic scenery and more often than not bring you to a warm white sand beach. Oh, did I mention the food. Every U.P. town has at least one restaurant and saloon that serves up a good bar burger. Ever had a pasty? The pasty was brought to the U.P. by Cornish miners. Their wives would heat them up in the morning and the miners would strap them to their bellies before going down in the cold mines. I guess the shared heat kept the miner warm and the pasty somewhat edible by lunch time. I’ve thought a couple of times about strapping one to the side of the V-Twin to see if it would stay warm on a cool October ride. Now if a pasty isn’t your thing, then I personally recommend you try Lake Superior Whitefish. Any fish coming out of the icy cold waters of Lake Superior is simply the best. I’ve been asked when is the best time for a road trip through the U.P. I can tell you it’s not February, although you can catch some great motorcycle ice racing then. The cruiser riding season is mainly from May to October with the best chance of great riding weather coming in July, August and early September. That’s one reason U.P. Bike Week takes place during the last week in July. In case you haven’t guessed it, Michigan’s Upper Peninsula can be a pretty wild and pretty rustic in places. Keep that in mind when you take that curve on Upper Michigan’s back roads. You could find a deer, bear or even a snapping turtle in the middle of the road when you come out of your turn. Even more dangerous might be those friendly Yooper taverns up the road serving happy hour. There might not be a lot of traffic in the U.P., but you still need to stay alert and ride smart. Unless you’re flying or bringing your bike in by boat, there are only so many ways to get to Upper Michigan. If you’re coming up from the Lower Peninsula chances are you’ll be crossing the Mighty Mac. The Mackinac Bridge is one of the longestsuspension bridges in the world and will provide for an interesting, if not a bit of an unnerving ride. If you’re making the trip down from eastern Canada, it’s theInternational Bridge. To be honest, I haven’t ridden across the International Bridge, so I can’t give you any personal insight about riding that one. The Big Mac can be an experience. You will almost always see construction going on during the summer months. For those coming from the southeast you might want to consider a ride on the SS Badger Car Ferry over to Wisconsin and then ride up to the U.P. For everyone else you’ll be entering through some point from Wisconsin, which might explain all the Harleys one sees rolling north out of Wisconsin on any given weekend. So if you like the open road, spectacular scenery, and friendly little towns, then come ride Michigan’s Upper Peninsula. If you have any questions, please feel free to email us.